We recommend setting up auto renew to save yourself a monthly to-do job. Not everyone’s like us though, so it’s your call (geddit?!). You choose what’s best for you – power to the people! 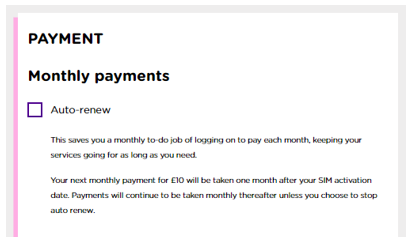 Benefits of auto renew: if you’re a forgetful kinda person (no judgement), you can save your payment details and sign up to ‘auto renew’. This way you’ll never need to remember to pay for the month you want to use Superdrug Mobile; you’ll always have service available! In the unlikely event you decide to leave us (boohoo! ), you can choose to stop renewing and using our network. We’ve got your back: if you choose not to set up auto-renew, we’ll send you a couple of reminders near your renew date to make sure you’re not without mobile service unexpectedly. We’ll drop you a text and an email 7 days before your plan is due to expire, and again the day before. Just in case you’ve been sooooo busy that it slipped your mind. If you don’t auto renew (and you forget to pay), your plan will become inactive. Eek! If this happens you won’t be able to use any Superdrug Mobile services, such as using data, sending or receiving calls/texts, etc..